A callow cowboy (John Travolta) transplanted to Houston marries a feisty young woman (Debra Winger) he meets in a bar, but their marriage is quickly beset by jealousy and infidelity. 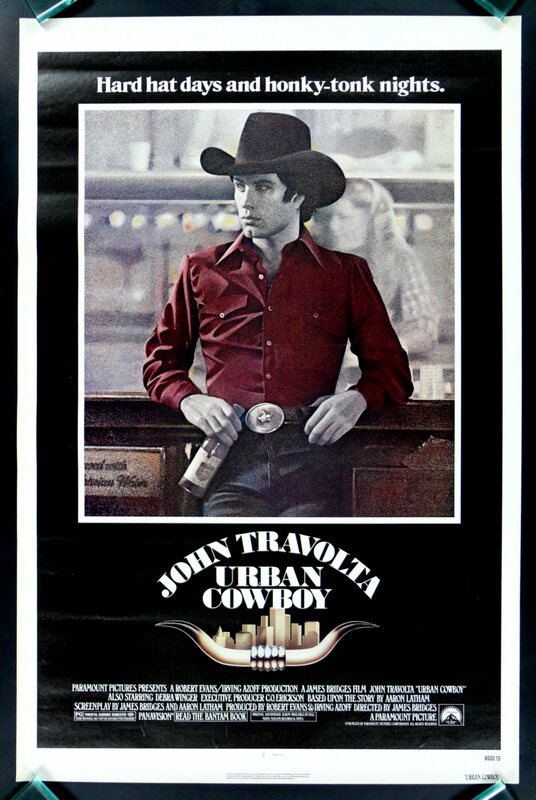 After achieving phenomenal fame in both Saturday Night Fever (1977) and Grease (1978) — and then enduring ridicule for his role as Lily Tomlin’s lover, “Strip”, in Moment by Moment (1978) — John Travolta starred in this film about a headstrong young country boy whose adventures in the Big City (Houston) include both a tempestuously whirlwind marriage and a nascent obsession with riding mechanical bulls. Indeed, the newly popular sport of mechanical bull-riding — shown on-screen here so many times you’ll likely be yawning by the end — becomes a central element of the storyline, overtly representing Travolta’s quest to prove his manhood to his new wife, especially when faced with stiff competition in the form of ex-convict (and master rider) Scott Glenn. Unfortunately, the screenplay (co-written by director James Bridges and Aaron Latham, based on Latham’s own story) disappoints in its presentation of marital challenges and machismo run amok. Travolta and Winger’s marriage, while perhaps sadly realistic, is based on nothing more than chemistry and a desire to play at housekeeping, with little real understanding of what such a commitment will entail. It’s not at all surprising, then, when their romance quickly falls apart, especially given Travolta’s intermittently abusive treatment of Winger. Glenn’s villainous bull-rider is menacing but one-note, and Travolta’s new lover — a beautiful, slumming heiress (Madolyn Smith) with a “thing” for cowboys — simply strikes one as a caricature. It’s Winger — nurtured by her mentor, Bridges — who gives the film’s most nuanced and noteworthy performance, and remains the primary reason to give this film a one-time look. Note: For a much better variation on some of the same themes touched upon here, see Nicholas Ray’s The Lusty Men (1952). No, though it’s worth a look simply for Winger’s performance. Listed as a Personal Recommendation in the back of Peary’s book. This is little more than an ’80s date movie, plotless and fashioned around a fad. It’s certainly a lot longer than it needs to be – and it’s the kind of movie which is so thin that, at one point, a character dies just so something *does* happen. Everything eventually leads to a bar contest which is surprisingly lackluster.